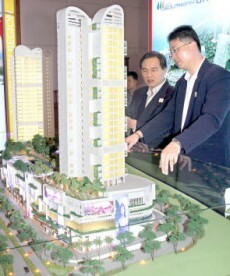 KUALA LUMPUR: Kumpulan Jetson Bhd is teaming up with Fortress Effect Sdn Bhd to undertake a luxury residential development project in Penang, comprising of 33 high-rise condominiums. Kumpulan Jetson said on Tuesday Fortress Effect was nominated by China's Everbright International Construction Engineering Corporation to be the co-developer in the project. Everbright's unit Everbright International Engineering Sdn Bhd will take part in the project on a joint venture basis. Kumpulan Jetson's entitlement under the proposed joint development would be 30% of the gross development value and Fortress Effect's entitlement 70% of the GDV. The parties agreed that Everbright International Engineering would be appointed the designated contractor to undertake the construction and completion of the project. KUALA LUMPUR: The world-renowned Harrods department store has set its eyes on Malaysia as the site of a Harrods Hotel. An invite sent to the media said Qatar Holding LLC would be signing a memorandum of understanding with Jerantas Sdn Bhd today to explore Malaysia, specifically Bukit Bintang, as the ideal site for the next Harrods Hotel development. According to sources, Qatar Holdings will be working with Tradewinds Corp Bhd (TCB) on the venture. TCB holds the franchise for the Harrods retail stores in Malaysia and had indicated as early as 2008 in its annual report that it could collaborate with Harrods in future residential, commercial and hotel projects, especially in Kuala Lumpur. According to a source, there is also a possibility of Harrods Residences opening together with the Harrods Hotel. “The Harrods Residences will be sold at a higher price than The Banyan Tree Residences,” the source said. In September last year, the then Kuala Lumpur mayor Tan Sri Ahmad Fuad Ismail revealed that a consortium of three developers was proposing to build the Harrods Hotel. Apart from Qatar Holding and TCB, sources identified the third interested party as Datuk Desmond Lim. Qatar Holding and Lim both are the major unitholders of the Pavilion Real Estate Investment Trusts. Ahmad Fuad had at the time identified a piece of land in Jalan Conlay near Restaurant Seri Melayu as a suitable site for the hotel. The restaurant, which is owned by Amcorp Group Bhd, sits on land that is leased from Lembaga Kraftangan Malaysia. Lembaga Kraftangan comes under the Information, Communications and Culture Ministry and acts as the custodian for the Federal Lands Commissioner. It is understood that the government had put out a tender for the sale of the said land. It also understood that Lim owns the lease on the strip of land where the Chulan Square restaurants are located. The signing of the MoU, to be held at the Pavilion Mall, here, will be attended by Qatar Holding vice-chairman Dr Hussain Ali Al-Abdulla and Jerantas corporate representative Tan Sri Abdul Aziz Ismail. A search on the Companies Commission of Malaysia (SSM) revealed that Jerantas' main shareholders are PS Trading Sdn Bhd (33.99 per cent), Gagasan Simfoni Sdn Bhd (65.99 per cent), with Saharuddin Abdullah and Sumami Kiman each holding one share. The directors of the company, appointed in March 2012, include Datuk Manan Md Said, Raja Sa'adi Raja Amrin and Shaharul Farez Hassan. Shaharul is group chief executive officer of TCB. Manan and Raja Sa'adi have an equal share in Gagasan Simfoni and are directors of the company. 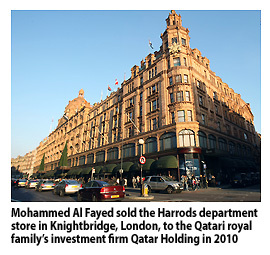 The Harrods department store in Knightbridge, London, was sold in 2010 by Mohammed Al Fayed to the Qatari royal family's investment firm Qatar Holding, which is also the investment arm of Qatar Investment Authority (QIA). It was reported previously that a Harrods Hotel was planned on the rooftop of the department store. The status of this project is unknown. Qatar Holding LLC said it plans to open Harrods-branded hotels in cities around the world including New York and Paris, two years after buying the British luxury retailer from the family trust of Mohamed Al-Fayed. The Doha-based company, an arm of Gulf Arab state’s sovereign wealth fund, signed an agreement with Malaysian partners today for a proposed hotel in Kuala Lumpur’s Bukit Bintang shopping district. A hotel management company will be established to seek out similar projects around the world, according to a joint statement by Harrods Ltd and Qatar Holding. The Kuala Lumpur hotel would be the group’s first in Asia. It also wants to open in China, Al-Abdullah said. Construction will start in a year on a 5.5-acre (2.2 hectare) site in the Malaysian capital, he said. About RM2 billion (US$634 million) will be spent on the development, which will comprise as many as 300 hotel rooms, apartments and retail space, said Al-Abdullah. Its preference is to build on sites already owned by Qatar Holding or its affiliates, such as London’s Chelsea Barracks site or Sardinia’s Costa Smeralda, according to the statement. “Qatar Holding ultimately intends to grow Harrods into a global enterprise that defines the luxury retailer and leisure sectors,” it said. Qatar Holding is part of the Qatar Investment Authority, which is the largest shareholder in the J Sainsbury Plc grocery chain in the U.K, and invested US$2.8 billion in Agricultural Bank of China Ltd’s initial public offering last year.